Can IUDs Delay MS Onset? 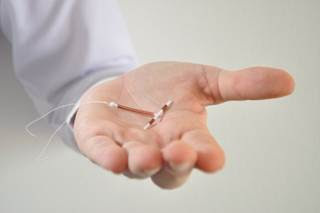 Use of an intrauterine device (IUD) may delay the onset of multiple sclerosis (MS), research indicates. The investigators, who presented their findings at the 2016 CMSC Annual Meeting in National Harbor, MD, hypothesize that the material of the IUD may play a role in disease development. Hormonal contraceptives have previously been linked to a greater risk of MS, however it is not known how or if the use of contraceptives influences age of MS onset. In order to investigate this possible relationship, Katelyn S. Kavak, MS, of the Jacobs MS Center of Treatment and Research in Buffalo, NY, and colleagues administered an extensive reproductive questionnaire to a subgroup of 235 women with MS from the New York State MS Consortium. No difference in age at MS onset was observed between women who used oral contraceptive pills (n=195) and those who did not, however women who used an IUD (n=35) had a significantly higher mean age at MS onset (34.3 ± 10.5) than those who never used an IUD (30.7 ± 8.9, P= .033). The younger a woman was when she started to use an IUD, the older her age at MS onset (β = –0.615, P= .022). Women who started using an IUD earlier (≤ median of 23 years) had a mean age of symptom onset of 38.9 ± 9.7 compared to those who started later (> median of 23 years), who had a mean age at symptom onset of 27.4 ± 8.5 (P= .001). This finding remained significant even after adjusting for past pregnancy. While information regarding the type of IUD used – copper vs hormonal – was not available in this study, the researchers hypothesized that copper IUDs, which were used more commonly prior to 1990 and are known to reduce ferritin levels, may play a possible role in the underlying pathways of MS development.